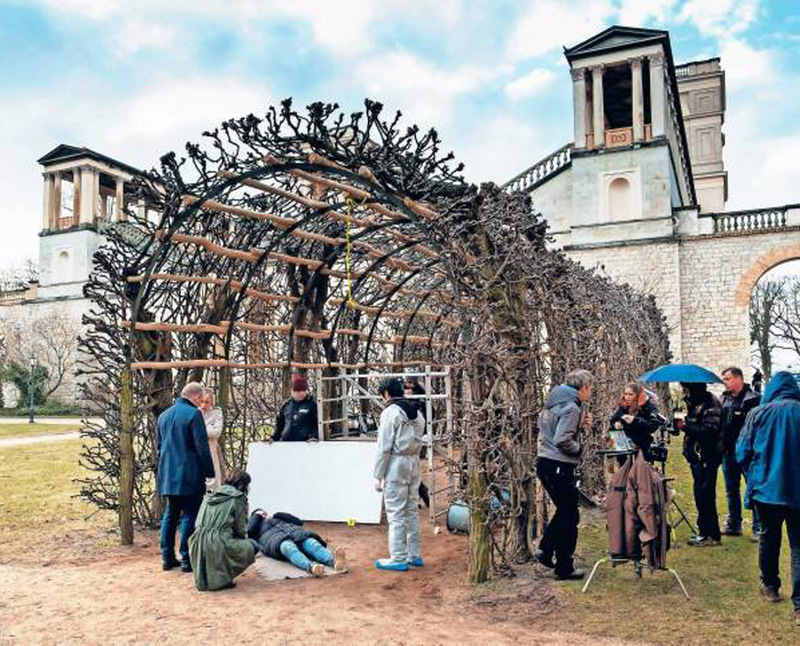 Time and again, filmmakers have been drawn to the Pfingstberg ensemble as a film location. The architectural effect of the Belvedere on the big screen can alternatively seem imposing, romantic or mysterious. It is ideal for staging productions in almost any film genre. The palace with the stunning view has already played roles in crime stories and fairytales. But television stations, such as rbb, also keep coming back to Pfingstberg for diverse types of programming. Information for planning your film project is available here. 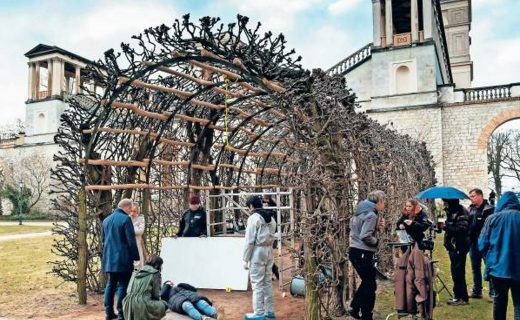 Pfingstberg was brimming with excitement in March 2018: That’s when the Bantry Bay Productions GmbH filmed scenes for the early evening television series “Soko Potsdam” broadcast on the German ZDF station. Just what happens on Pfingstberg will not be disclosed, however, because the air date has yet to be determined. The leading roles in Soko Potsdam are played by Luna Kunath (Caroline Erikson) and Sophie Pohlmann (Katrin Jaehne), the investigating police detectives. In addition, the team is comprised of police chief Bernhard Henschel (Michael Lott), their colleagues David Grünbaum (Omar El-Saeidi) and Christoph Westermann (Hendrik von Bültzingslöwen), forensic expert Werner Vense (Dietrich Hollinderbäumer) and crime scene technician Thomas Brandner (Yung No). The production was directed by Stefan Bühling and Isabell Braak. 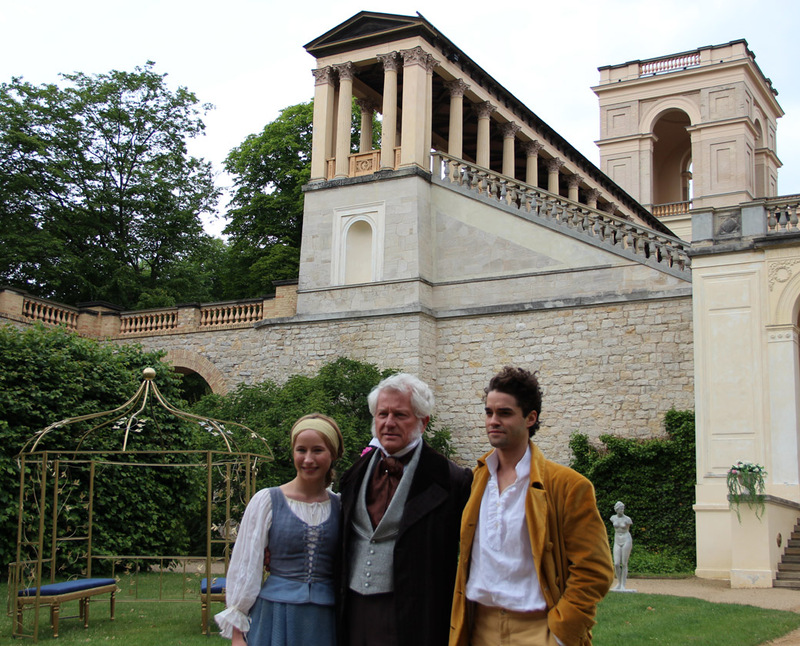 The rbb fairytale movie “Der Prinz im Bärenfell” was shot at the Belvedere – Pfingstberg in 2015. Without much ado, the Belvedere and garden were transformed into a romantic royal palace suited to this purpose. Mira Elisa Goere (Elise), Miroslav Nemec (the king) and Maximilian Befort (the prince) played the leading roles in the film. The ZDF and rbb television stations frequently show this movie in December during the Christmas seasson. It was produced by Askania Media Filmproduktion, directed by Bodo Fürneisen and based on a screenplay by David Ungureit.